As part of a design-build team with Interstate Industrial Corporation (IIC), PS&S provided fully integrated design engineering, permitting and construction phase services to assist the New York City Department of Sanitation (NYCDOS) with the closure of the Fresh Kills Landfill. Opened in 1948, the Fresh Kills Landfill was once the largest landfill in the country. The City of New York committed to close the landfill by December 31, 2001; however, the City would take advantage of federal Section 29 tax credits if engineering control of the landfill gas (LFG) was in place by June 30, 1998. The challenges for PS&S were two-fold. First, PS&S had to prepare an air permit application in full compliance with strict UESPA New Source Performance Standards and New York State of Department Environment Conservation (NYSDEC) regulations. Then, PS&S needed to develop a site-wide LFG collection, control and management system that would comply with stringent air quality standards. 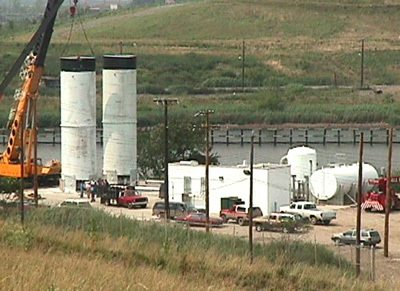 The 2,200-acre landfill facility comprises four separate sections. PS&S’s solution incorporated the partially completed LFG collection systems for the two smaller sections and, for the remaining sections, designed LFG collection systems that included horizontal LFG collection trenches, over 700 vertical LFG extraction wells and 25 miles of piping. A site-wide LFG transmission main directed the LFG to four self-contained flare stations. Each pile-supported, stand-alone flare station included a control building, two 5,000 scfm flares, blowers, knock-out drums, valves, piping and controls. PS&S’s full-service capabilities enabled the design of other project-dedicated supporting infrastructure that included a fire water protection system, an onsite electrical distribution system and a condensate management system. Working closely with the City and IIC, PS&S’s design was completed ahead of schedule and enabled the City to take advantage of the federal tax credits and comply with the landfill closure commitments.